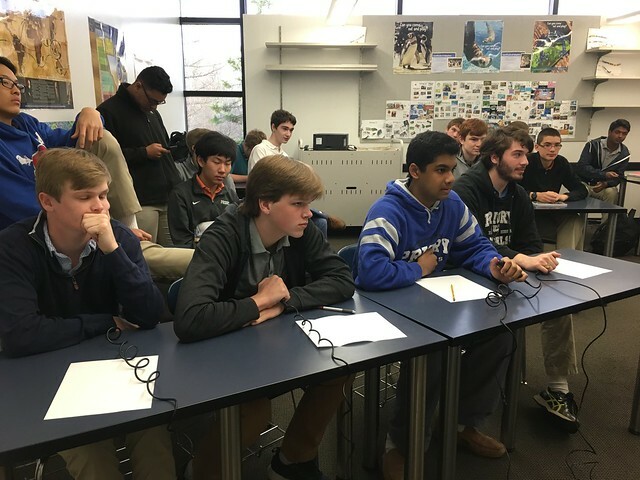 Priory’s Scholar Bowl team challenged Dr. Andrew Davis (the faculty moderator) and his peers to a competition with subject matter in multiple academic disciplines, including science, mathematics, social studies, communication arts, fine/performing arts, and miscellaneous. The school was abuzz with expectation, and Dr. Rashford was recruited to serve as the questioner. Students and faculty alike packed into room 410 in the Science Wing the morning of Tuesday, March 21 to face off, and to enjoy the competition. Scholar Bowl is a trivia-type game with questions on a variety of subjects. Each team of four has buzzers they can hit to signal they have an answer. The questioner does not need to finish reading the question before a player can buzz, although sometimes hearing the end is vital to providing the right answer. Mrs. Reichle, the former Scholar Bowl faculty moderator, kept score for most of the game, taking a break to participate on the faculty team while Dr. Kalhorn took over at the white board. The competition was fast-paced and lively, and the students quickly pulled ahead. Each round consisted of a Toss Up Question, in which anyone from either team can attempt to answer. Whichever team wins the toss up is then given the opportunity to answer Bonus Questions. If the team is unable to answer a bonus question, their opponents are given the chance. The students took the lead from the very beginning, leaving the faculty team trying to catch up throughout the event. At several points during the game, the teams were shaken up with new members rotating in. The changes weren’t enough for the faculty team, which ended up losing to the students by a final score of 280-300. Several faculty members were heard grumbling that clearly they had taught their students too well. Here is a sample of some of the Scholar Bowl questions. How many would you be able to answer before a talented team of Priory students? Probability’s Markov chains have a “transition” one of these. Their characteristic polynomial can be used to fine eigenvalues. They are symmetric if element ij equals ji, that is, if they equal their own transpose. One of these film characters owns “royal flush” plumbing and another is the plus-size Vogue editor. These characters kidnap Jack Black for a telethon to save their theater. The Druk, one of these creatures linked to thunder, appears on the flag of Bhutan. Yingling is a rain one in Chinese myth. The Windward and Mona Passages link the Atlantic Ocean to this sea. It is bounded by the north and east by the Greater Antilles and Lesser Antilles, respectively. This arid region bordering the Hexi Corridor, the Altai Mountains, and the Yellow River is expanding by over 1,000 square miles per year. The Nemegt Basin fossil fields are in what desert that covers half a million square miles in northwestern China and southern Mongolia? The electronics company Phillips and the oil company Shell are based in this country, which in 2011 began attempts to end drug tourism by limiting access to marijuana cafes to citizens. One work by Max Weber correlates the “Protestant ethic” with the “spirit” of this system. Adam Smith’s The Wealth of Nations sets out a theory of this system, whose industrial form replaced feudalism, according to Karl Marx. Connected in parallel, resistors of 6 and 12 ohms are equivalent to one resistor of this many ohms. It’s the number of atoms in a methyl group, the atomic number of beryllium, and the number of chambers in the human heart.